What does it really take to launch and plan a health retreat business? We thought we would share how we navigate our nomadic lifestyles while building a business together and running separate businesses and passions on the side, individually! As much as we would like you to think the nomadic lifestyle is as perfect and seamless as many social media accounts may lead you to believe, it actually takes a lot of hard work living and launching a business abroad. But, about a year into our journey, we’ve realized we wouldn’t have it any other way! Let us walk you through our new and improved “9-5” grind. Since we don’t have to clock in at any particular hour, it is imperative for us to set up a routine so we have a sense of normalcy and ensure that we maintain a work-life balance. Many people would imagine that in places like Bali, our priority is to have fun on the beach, rather than getting work done! It’s actually quite the opposite. For us, it’s extremely hard to disconnect from work when it is constantly at our fingertips - and no one is telling us to stop. Especially, when considering time zones and the fact that our major markets are in the West; business hours can be around the clock if you allow them to be. The never ending to-do lists and unread email pile up when starting a business. You are your company's Marketing Professional, PR Specialist, Accountant, IT Support, Ops Extraordinaire, and HR Rep all in one day. We often have to remind ourselves that the reason we left corporate life was to be able to find that balance. Rest is work (and it is so valuable)! So for us, The first step in maintaining balance is the big R word: Routine! So what does our “Routine” look like? While working and living abroad, we generally take the first few hours in the morning to invest in ourselves. Both of us place a lot importance on daily intention setting, and finding inspiration from other fellow entrepreneurs. Whether it’s through podcasts, articles, or books, we are continually looking for outside inspiration and ways to incorporate it into our lives and our business. We also focus a large part of the morning on strengthening ourselves and our brands. For Whitney that means allocating time to her daily meditation and yoga practice. And while Tameika starts her day with meditation, the majority of the AM is spent working on her other businesses. After we are feeling inspired and personally/professionally fulfilled, we then head out to the gym around 10 in the morning - as health and wellness is at the cornerstone of the lifestyle we live and promote. We get in at least four heavy workouts a week at our gym and do our own additional cardio and yoga as desired. Our gym time is honestly one of the highlights of the day. We start the day off feeling empowered and refreshed. We support each other and hold ourselves accountable for placing emphasis on our health and wellness first. After our morning gym sessions, we head to one of our favorite healthy cafes where we set up shop and divide and conquer our task lists for the day. From booking local vendors, to developing our website and budget planning, there is always at least 10-15 items on our to-do list. Each of us has our own areas in which we excel and we are lucky enough to have designated a great work flow so that we each enjoy our daily tasks and lean on each other for inspiration and assistance when necessary. Some days call for more hands on work. 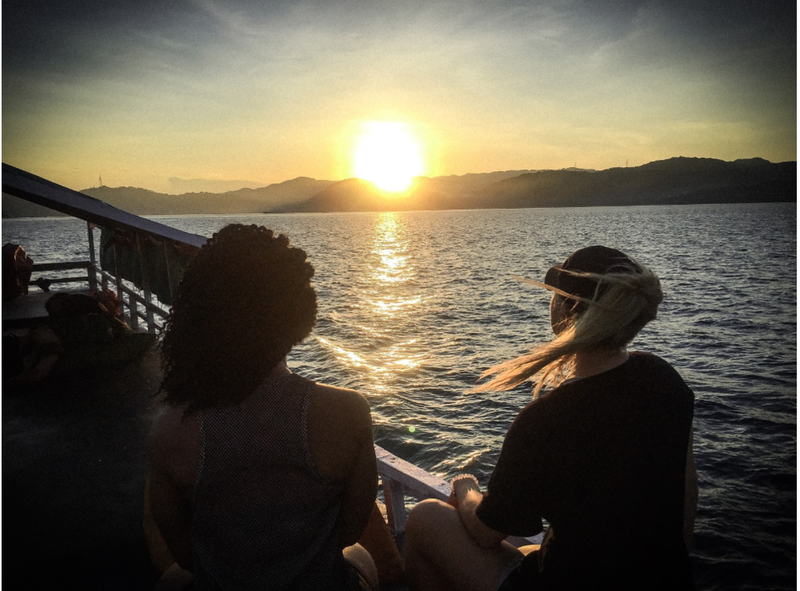 For example we had several “fun” filled days of shopping and adventure on our motorbike in which Tameika manoeuvred the thick Bali traffic while Whitney navigated. While shopping is a fun pastime for many women, shopping for 14 women is an adventure in itself, especially when you are carrying all of the materials home in a backpack on the back of a scooter LOL. Our first retreat was a labor of love. We braved the heat and traffic jams, to ensure that each welcome gift was special and memorable for the girls. We dealt with language barriers, conversion rates, and a slew of other challenges; looking for items like a whistle and agility ladder in a foreign country can be a lot harder than you think. These excursions always kept us on our toes as we never knew what to expect. However, we feel it is the personalized touches and care we put into our retreats that ultimately distinguish our retreats from others. It is well worth the investment for us to shop locally and do the leg work ourselves. Us in Bali traffic, on a motorbike, with about 50lbs on our back of retreat swag! In the evenings we generally attempt to do something positive for ourselves. For example, there are weekly free seminars in our community that are focused on self-development which we love. Sometimes, we catch a sunset, a restorative yoga class or grab a relaxing dinner with friends. The weekends we generally try to allocate to adventure. Whether it is exploring the bright city lights on a weekend getaway to Singapore, or hopping on a boat to a remote island for some RnR, we certainly live it up on the weekends and take full advantage of living abroad in regions that afford us tremendous travel opportunities. However, through all of our transit (i.e. choppy five hour boat rides or long layovers) we utilize the time to make our to do lists for the coming week as well as dream big for what the future holds for us and our business. We are continually thinking of ways we can make the Whole Experience even better and offer our services to a wider audience. It is such a blessing to be in a situation in which we are business partners that also really enjoy each others company. Weekend getaway to see the Komodo Dragons! And by the end of the week, our bodies are happy, we are well fed, intellectually stimulated and feel fulfilled - mind, body and soul. It’s not always glamorous but it’s always an adventure.